Dash Berlin is a name almost everyone is familiar with! It’s a group but the familiar face is Jeffrey Sutorius. They’ve been producing legendary music and have been in the music scene since 2006. 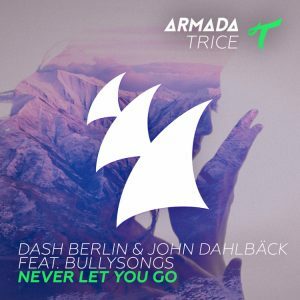 Dash Berlin has been featured in ASOT by Armin van Buuren and is signed with Armada Music (plus they produce fine tracks). “Never Let You Go” is produced by the combined efforts of Dash Berlin, John Dahlback & Bullysongs. The song has a progressive and melodious build from the beginning and the drop is a total killer! Also, the lyrics are motivational and worth listening! The appealing lyrics will make you think how great your relationship is. Coming to the video, it starts with Dash Berlin & John Dahlback on stage playing their set with a crazy vibrant crowd at a music festival. Then Andrew Bullimore from Bullysongs steps in and we see a couple who is on the move exploring the world and having fun. The duo is taking photos with their camera, loving each other and doing great things together and then somewhere in the middle while driving, their camera is swept away with the wind and the couple is sad but they put it in the past. In the next scene, a group of girls who are also on the move finds the couple’s lost camera. They take pictures of themselves and then sell the camera to an antique store for some bucks. 4 years later, the couple who had lost their camera walks into the same antique shop with their kid. The girl looks at the familiar looking camera and realizes that it’s the same camera which was lost on their trip earlier. So, she picks it up and feels nostalgic when she sees the pictures and recording of their journey when they had lost their camera.